Online Influencer and political analyst Atty. Paula Defensor Knack, the sister of the late Miriam Defensor Santiago, came to the president’s defense as she said that it is common for world leaders to skip some of the events in a summit. This is in connection with the criticisms that the opposition hurled against the president, saying he was too ill or too lazy to attend the other events. 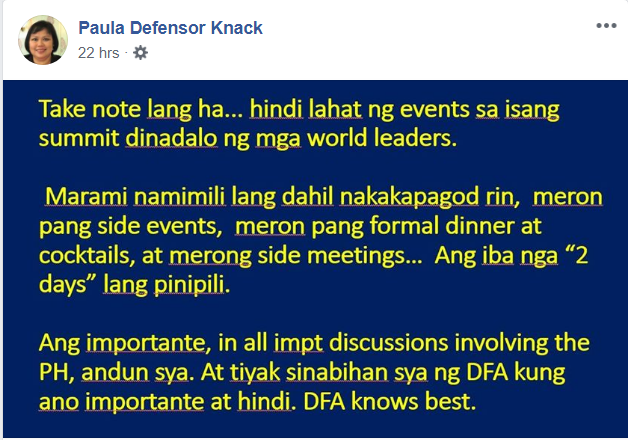 In a post she shared on her Facebook page, Paula Defensor Knack stated that attending a summit is very exhausting for a world leader, with all the meetings and galas, not to mention the other side events. So it is not uncommon for world leaders to skip some of them, especially if the meeting will not require the leader’s presence. Donald Trump has done this, allowing the VP Mike Pence to attend the summit. Even the host leader, Singaporean Prime Minister Lee Hsien Loong, was represented by his cabinet officials in two meetings because he couldn’t attend to it. 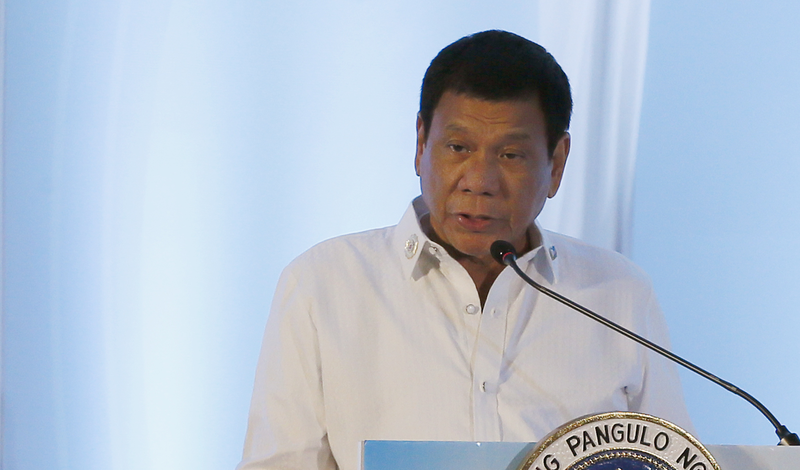 The president drew a lot of criticisms for missing 6 of the 11 meetings in the ASEAN summit. The palace said that he was resting and was catching up on sleep due to exhaustion. Because of this, the detractors and critics of the president had a field day and hurled their criticisms about the president’s actions. The Makabayan bloc accused the president of intentionally skipping some of the events so that he will not be questioned about the human rights situation in the country, as well as his South China Sea policy. Senator Trillanes meanwhile said that the president is either too ill to attend the meetings or just simply lazy. According to Knack, on the times that the president were not around, he had Foreign Secretary Teodoro Locsin Jr. attend for him. We all know that Secretary Locsin is one of the most qualified and brgihtest member of his cabinet. Knack also said that what is important is that the president was present on the most important meetings, the ones that really counts, and he more than fulfilled his commitment to the nation.